We’re all familiar with the ​classical impact structures on the Moon and the Rocky Planets. Through our telescopes, we can observe the geometries of impact craters and the giant Impact Basins on the Moon - and through books and the Internet we’ve a pretty good idea what these features look like on Mercury and Mars. However, what happens when a comet, an asteroid, or a large meteor impacts the surface of an icy moon, such as those that orbit the Outer Planets ? What do those impact structures look like, and how do they compare with those preserved on the Rocky Planets ? Let’s start with a look at the old battered surface of Callisto, one of Jupiter’s ice moons. Because Callisto is essentially cold and “dead”, the impact features that have accumulated since the beginning of the Solar System are still beautifully preserved. Valhalla - palace of the Norse Gods - is a 4000 km wide multi-ring Impact Basin, superficially very much like the Orientale Basin on Earth’s Moon, or the flooded equivalent that we call the Imbrium Basin. However, Callisto is made of ice and ice does not have the same strength characteristics as rock – so it’s not surprising to see significant differences. Look at how shallow the central depression is at Valhalla. Now look at the number of concentric ridges that surround the impact site - something like double the number for the best lunar examples. In addition, there are no rays of ejecta flung out from the impact site. Everything points to impact into something relatively soft - more of a “splat” than an explosive impact ! That would also explain the low relief of the concentric ridges and the shallow central cavity - the initial impact structure would have collapsed somewhat like melting ice cream. The concentric ridges do have some topographic relief though, as you can see here : enough relief to cast a good shadow when the Sun is low on the horizon. But, here’s a surprise : in addition to the 10 or so principal concentric ridges or scarps, there are many minor low relief scarps between them – as indicated by the red box - another feature we don’t see on the Moon or on Mercury. Valhalla is an old Impact Basin. We can tell that because of the density of smaller impact craters that have scarred the concentric ridges of the Impact Basin itself. But this is not the oldest part of the Callisto’s icy surface : other parts of the moon have even higher impact crater densities, and so are even older. The impact craters on Callisto are obvious and show some features similar to those of the Rocky Planets. For example, the larger craters have central peaks, just like on Earth’s Moon. However, there’s something a bit odd about this battered icy surface : notice how the walls of the craters look like they have been “eaten away”. If we focus on the large crater in the red box, you can see that the walls seem to have moved around - even slid down into the crater pit. For physical reasons I don't yet understand, the ice of Callisto’s surface is capable of crumbling and moving around like sand - which is strange behaviour for ice. Europa is another of Jupiter’s ice moons, but one with a very young and active surface, as we can tell from the low number of preserved impact craters. Europa is so active that it’s constantly resurfacing itself and eliminating older impact structures. Even from space it looks as smooth as a billiard ball, which is a reflection of the fact that Europa’s ice is too weak to support the weight of a significant mountain chain like the Himalayas on Earth - or the ring of mountains around the Mare Imbrium on Earth’s Moon . the unpronounceable Pwyll crater - that’s Welsh by the way. Cilix crater - that's younger than a complex array of ridges in the icy surface of the moon. the multi-ring impact structure Tyre - notice the 20 Km scale bar : this is too small to be considered an Impact Basin. and Mannann’an - as difficult to pronounce as it is to see. What all of these impact structures share in common is again very low topographic relief, very shallow crater floors, and very low crater walls Again, this is a function of the inability of the relatively weak ice of the moon’s surface to resist the pressures generated by major differences in topography. Here’s the multi-ring structure Tyre placed in context. It’s only about 40 km across, and you can easily see how shallow it is. Technically this is referred to as a “macula” (literally a “stain”), and the lack of rays of ejecta is particularly obvious. On Earth’s Moon, this multi-ring geometry is only found in giant Impact Basins, but a structure of this size is clearly just a modest sized impact crater. This is not the youngest structure in this image : as you can clearly see, it’s cut by long ridges of the kind we have looked at in previous presentations. This is false-colour version of the same structure. It looks just like a “watermark” in Europa’s surface ice - which is technically referred to as a palimpsest (in case you come across that word in your reading). The accepted interpretation of these low relief impact features is that they formed in soft - perhaps relatively warm and thin – ice. Hold that thought, because we’ll come back to it in just a minute. Tyre is not unique. This is another “macula” on Europa - and this time it is the youngest feature in the image since it cuts all the triple-band ridges in the surrounding ice. Here is the unpronounceable Pwyll. The impact crater is the 25 km wide dot in the middle of the white splash zone. In contrast to the previous structures, this one has an enormous set of ejecta rays thousands of km in length : just look at the scale bar. Because the rays cut across all the cracks and ice ridges, this must be a very young feature. Now, the question is: why does this impact crater look like a classical lunar feature - such as Tycho on Earth’s Moon - when we’ve just seen that other impact features on Europa are so different ? One possible answer is that this impact crater formed in stronger, relatively cold and thick ice than the Tyre multi-ring structure. This sounds like a pretty good explanation … until you go in a bit closer. Here’s a close-up on the Pwyll impact crater itself, and there’s no topographic relief whatsoever – just like Tyre. That suggests that the ice was too soft to support a deep hole and high crater walls - all of which puts us back to square one in trying to explain those ejecta rays we saw in the last image. The take-home message from the surface of Europa is that the impact structures there remain a bit of a mystery. Impact structures on the surface of Jupiter’s ice moon Ganymede come in two distinct flavours, depending on whether they occur in the older dark terrain, or the younger light-coloured terrain. In the older dark terrain, the impact craters look like those of Europa - except that they're more numerous. In other words the larger ones are generally shallow with very little relief, and show no ejecta rays at all. In the younger light terrain, all impact craters are well formed, with deep floors and high walls, and they're surrounded by very obvious splashy white ejecta rays - that you can even see from a great distance - as in this image. Let’s zero in on the red box. First, the closely-spaced, slightly curved grooves that run NW-SE are the remnants of a giant multi-ring Impact Basin similar to Callisto’s Valhalla. Second, the grooves have been overprinted by large impact craters, which are therefore younger than the Impact Basin. Notice how both the grooves and the larger impact craters have very subdued topographic relief. Again, we ask the question, does this indicate impacts into relatively soft ice ? Third, the large impact craters and the grooves are battered by smaller, younger impact craters. These are well formed with deep floors, high crater walls and central peaks. 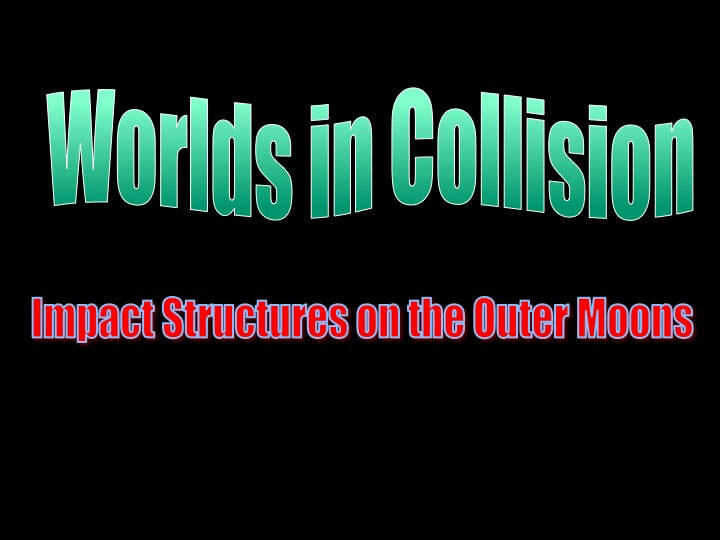 In other words classical impact craters. These small craters look like they formed in relatively hard ice, but it’s all the same ice ! As you all know from shoveling your driveways, relatively warm ice is relatively soft – and relatively cold ice is relatively hard. Is it possible that in this image we are observing evidence for the progressive cooling and stiffening of the surface ice of Ganymede with time ? Let’s take a close up look at one of Ganymede’s impact craters in soft ice. Not only is Neith’s topographic relief very subdued, it’s inverted ! The outermost red ring marks the outer limit of the very shallow 160 Km wide crater. Closer to its centre is a ring of what looks like chaotic rubble, and we know that central rings instead of central peaks are well developed in large lunar craters. In the centre - instead of a hole – we have a hill ! What’s happened here is that the walls of the initial hole (transient cavity) that formed in the soft ice collapsed to fill in the hole - and by flowing in from all sides towards the middle, the ice produced a dome at the impact site. This process of flow in soft material to fill in a hole like this is known as “viscous relaxation” because the pressures in the ice around the hole are relaxed by viscous flow of the ice back into the hole. Just so you don’t get the idea that this is something weird and unique to Ganymede, here’s the same thing in the impact crater Doh on Callisto. In another part of Ganymede’s surface we see a wide expanse of light young ice with large blocks of older darker ice floating in it. Notice how the impacts in the younger ice are very different from those in the dark terrain. Just like Pwyll on Europa, they're very splashy with extensive white ejecta rays. The one exception is circled here where a splashy crater has formed in dark ice, but that simply tells me that this particular patch of dark ice is very thin and is underlain by light coloured young ice. This is what craters in the light young ice on Ganymede look like close-up. They're well formed with deep floors - high crater walls - a central peak in the northern one - and well defined collapse structures preserved against the crater wall in the southern one (which, by the way, is symmetrically hexagonal in plan !). The beautiful preservation of these classical impact crater features tells us that this young ice must’ve been strong - and presumably relatively cold. So can we explain all the differences between the subdued older and splashy younger impact craters on Ganymede in terms of the hardening of the Moon’s surface ice as the temperature decreased with geological time ? I’m afraid not ! Here’s an impact crater chain (catena) that crosses the boundary between battered old ice to the SE and less battered younger ice to the NW. The crater chain formed by an impactor that had broken into separate bodies prior to impact (i.e. instantaneously). Notice the lack of ejecta material associated with the crater chain in the old ice - and the splashy light coloured ejecta associated with the same crater chain in the younger ice. The craters look similar in both parts of the chain - so it’s reasonable to assume that the ice was equally strong in both the older and younger terrains at the time of impact. I have no idea how to explain the distribution of impact ejecta in this image. I’ve thought about it - and I’m stumped ! I want to end this presentation with a brief look at what happens when a relatively large impactor hits a relatively small icy moon. Here are 3 views of the crater Odysseus in Saturn’s relatively small ice moon Tethys : note the scale bar for the image on the lower left. Compared with the size of the moon, Odysseus is so large that its floor curves with the moon’s surface : so, if you were standing at the foot of the crater wall, the other side of the crater would be out of sight - beyond your immediate horizon. The relative sizes of moon and impactor were such that the moon only just held together, and it's probable that icy Tethys was soft enough to absorb the impact - rather than shatter. Finally here's Miranda, the strangest moon in the outer Solar System - in orbit around Uranus. It’s surface comprises huge angular blocks of a strange “banded” terrain with few impact craters, surrounded by a densely impacted terrain. The impact crater distribution would suggest that the banded terrain is younger, but the internal structure of the banded terrain appears to be folded like a chevron - and the fold appears to be truncated at the terrain boundary. Geologically this would suggest that the banded terrain was folded first, then included in the surrounding terrane - in apparent contradiction to the sequence deduced from the impact cratering. The initial explanation for this moon was that – unlike Tethys - it did indeed explode and shatter when struck by a massive object, but that its exploded components didn’t separate by much and were able to accrete back together again to form this “Frankenstein” moon by gravitational attraction. Planetary scientists have since realised that this simply won’t work, and are now suggesting that the bands in the banded terrain represent fractures at various angles that guided the eruption of ice volcanism that replaced the older ice - and that the large blocks of banded terrain are bounded by large geological faults that explain their abrupt boundaries. I have to tell that this is a pretty sketchy theory - but it’s better than the model of an exploded and reassembled moon to explain Miranda. So, I end this presentation on impacts with the case of the impact that never happened after all … ! !